I am glad that I was able to visit again the town of Solsona in their recently concluded fiesta after a long time. In the 90’s, we frequent this town just to visit and enjoy the Karingking River. We take our interns from the universities of Naga City, Angeles City, Baguio City and Ilocos Norte for picnics and swimming in this beautiful town. I have tried once the galong-galong or wooden cable car that sway from one side to the other. That was simply amazing. I clearly remember in 1998 that I was tasked to be one of the judges in the search for the Clean and Green Program of the national government. The town of Solsona was my number one for it has a good, workable and sustainable solid waste management. They were equipped with shredders to transform their waste into fertilizers. Children in schools were taught how to manage their own trash. They were trained to place candy wrappers in a pillow case where they can use it as cushion for their seat. They employ the scheme of three R’s: reuse, reduce and recycle. 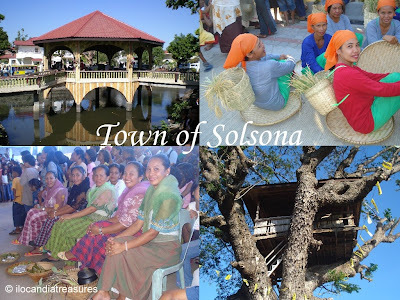 What I love to see in Solsona is the thoroughfare which was lined up with acacia aury and other trees that made it green aside from the ricefields and the mountains. However, Solsona lost for just a few points in that year. The following year in 1999, they have proven their worth to be number one in the province then to the region as well. A big blessing was that they emerged as the national winner receiving the presidential trophy plus a big sum of money. A million bucks if Im not mistaken was the cash reward. Solsona became a winner for three consecutive years making herself as hall of famer. As I observed, Solsona still maintained to be as clean and green as ever. Truly she is a treasure of Ilocandia. Binibigay ko po ang pahintulot.Maraming salamat sa pagtangkilik ng aking blog.Pagpalain po kayo.